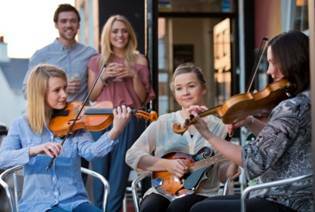 Traditional music can be traced back to almost two thousand years ago when the Celts arrived in Ireland. They brought with them, among other skills and crafts, music. Having been established in Eastern Europe since 500BC, the Celts were undoubtedly influenced by the music of the East, and indeed, it is speculated that the Irish Harp originated in Egypt. While travelling to Ireland, the Celts left their mark on the musical cultures of Spain and Brittany (Northern France) as well as in Scotland and Wales. However, it is here in Ireland that the tradition has evolved and survived that inhabitants and visitors alike gain pleasure from. Traditional Irish Music is celebrated today throughout the world. However, it is a special experience to immerse in the atmosphere of this, an oral tradition. Its prolific nature can be enjoyed in the most authentic way in local pubs, community centres and impromptu venues here in Ireland. Inishowen is home to some of the most talented musicians that practice the tradition during both their work and leisure, as well as during religious activities and commemorations. In days gone by traditional music and melodies took many forms in reducing the boredom of repetitive tasks, it kept the rhythm during synchronized pushes and pulls, and it set the pace of many activities such as planting, weeding, reaping, threshing, weaving, and milling. In leisure time, singing and playing musical instruments were common forms of entertainment and history-telling. Traditional music in the peninsula is still very much alive as one of the many cultural activities offered. From the shop selling handmade wares, (Glendowan Crafts at Clonmany), visitors can browse, and then listen to the traditional local music on a Sunday afternoon. 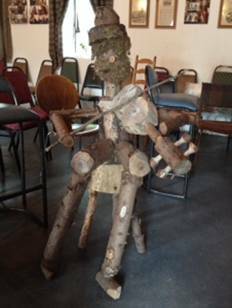 The image of the “wooden fiddler” is situated in the music room alongside the craft shop. This cosy meeting place with open fire and hearty welcome for all who play their instruments and those wishing to listen. Alternatively join the throng of voices, hustle and bustle of the pub atmosphere. Locals and visitors are celebrating traditional scheduled or impromptu meetings all around the peninsula. "It's a companion--it gives a lot and demands a lot. It never stops and is a life's work. All over the world, for whatever reason, people just seem to relate to it--there's just something about it. The challenges that face this cultural tradition is what continues to restore Martin's faith in playing. He quotes the old adage from John Doherty, "there's more in a fiddle than a man can know." Although Donegal fiddle music is world-renowned for its unique sound and bowing styles, Martin points out that Donegal fiddle music is diverse and really about the differences between different areas of the county. Martin hopes part of his legacy will be to "leave some tunes behind" as he continues to work on developing original material. County wide there are numerous locations that celebrate the art of legendary traditional music. Incorporating the concept of “Irish culture and heritage”, Events that celebrate music and dance with story-telling and historical content such as “A Taste Of Ireland” at the Clanree Hotel, Letterkenny and “The Celtic Feast” at An Grianan Hotel, Burt run throughout the summer. An Grianan Hotel –Celtic Feast, Shows on Sunday 19th of July, 30th of August, 25th of October, 2015. Prices are as follows: Adults €40, Child 10-12 €30, Child 6-9 €20, Child under 6 is Free. Glendowan Craft Studio - Sundays 15:30-18:00 on 14th of June, 12th of July, 13th of September.